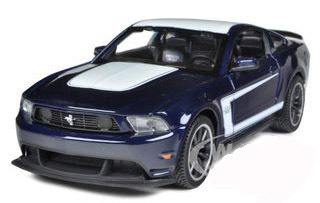 The best selection of 2012 Mustang diecast cars Anywhere! Whether your favorite Ford Mustang is a coupe, convertible, fastback or sportsroof, if it's available, you'll find it here. We're constantly searching out the best for you, whether you're a collector looking for a special model to round out your collection, or getting that little pony car enthusiast their first diecast car check the selection below. And if you're looking for model years other than the 2012 cars, check out the listings for the other section. If there's a classic or new Mustang that's made, chances are, we'll have it here. And we're constantly adding new models and colors as they become available. See something interesting? Click on the links for more details. check out this awesome 2012 Shelby Mustang GT350, it's a special 50th Anniversary Edition and very exclusive, with only 250 Produced Worldwide and includes a certificate of authenticity. Get your little piece of history and an amazing 2012 Diecast Shelby all at the same time. One of the fastest Mustangs around. Especially in the quarter mile. 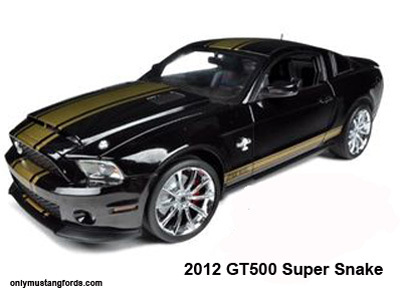 This cool 2012 Mustang diecast GT500 Super Snake is painted jet black with gold stripes. Like the GT350, it's a limited edition 1/64 scale car, with a total of only. 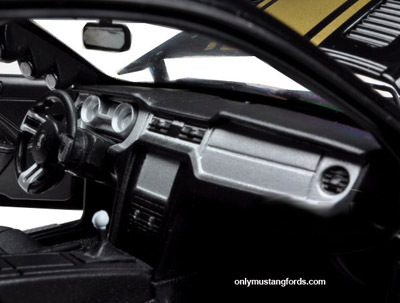 Check out the detailed interior in the 2012 GT500 Supersnake model below. You might miss this, if you don't follow the reproduction car market, but many of the early model year introductions, such as the new Boss 302 are listed by the manufacturer as the previous model year. 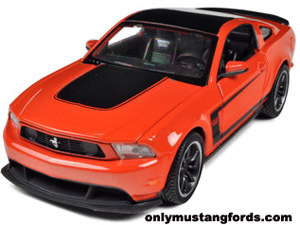 That's the case for this beautiful 2012 Mustang Boss 302 in Competition Orange. Your friends may still be looking for one, but you can have yours now! Listed as a 2011 Boss 302, enthusiasts will know this rocket is actually the 2012 Boss Stang! Blue is better, when you hit the road with your 2012 Ford Mustang Boss 302 . 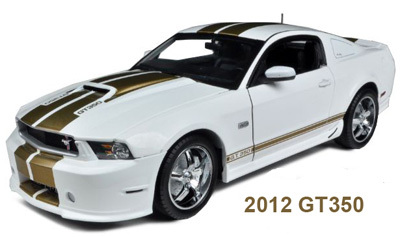 And what a great price to start your 2012 Mustang diecast cars collection!